With a simple but effective design that transforms rice husks into power, the Indian for-profit social enterprise is expanding at a rate of two plants per week. An ambitious agenda has them in up to 15 countries in 10 years–and serving some 15 million people. Sometimes the simplest ideas can produce powerful results. Husk Power Systems (HPS) is premised on a simple need–for electricity–and a simple material–discarded rice husks. The for-profit social enterprise was started four years ago by three Indians from the state of Bihar, along with one American classmate from the University of Virginia’s Darden School of Business. Their design philosophy is “simplifying the system so much that even a high school educated villager could be trained and run our power plants,” co-founder Manoj Sinha tells Fast Company. It is this philosophy of simplicity and corresponding success that has earned them substantial investments from the Shell Foundation and Acumen Fund and the prizes of a host of social innovation business plan competitions–including the Santa Clara Global Social Benefit Incubator. 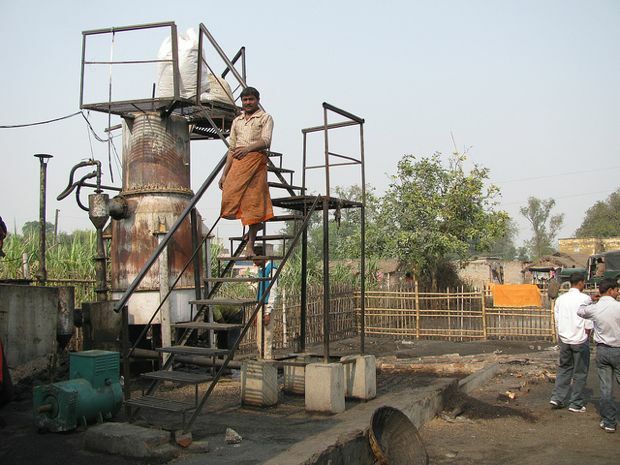 Already 60 rice husk power plants are up and running, serving 60 villages and 150,000 people. Now there are plans to run a Husk Power University and an international franchising system. HPS officially started in 2007 after Pandey had been experimenting for years with how to supply power to India’s most neglected, rural villages–places no access to power, many of which are in Pandey’s home state of Bihar. “We originally thought that some super high-tech solution would fix the problem. We were proven wrong,” Pandey says. Solar and wind power options were too expensive and not financially feasible for the team–a solar panel would cost $1500 per kilowatt installed. They settled on rice husks at half that cost and now their plants each power 400-500 households for 7-8 hours per day, primarily at night. Their mission is to “liberate rural India from darkness,” says Pandey. Co-founder Sinha says that one key to their success so far has been the recruitment of reliable people on the ground. He says that in an informal economy such as rural India’s, professional standards are low and it’s a struggle to find quality people to work for the for-profit social enterprise. But when it works, it works well. “The people feel like they own the plant—it’s a serious community investment,” says Sinha. Pandey and Sinha see HPS as a system, as opposed to just a power, product, or services company. Engaging customers at the bottom of the economic pyramid has become an integral part of the brand. “Gyanesh Pandey means nothing without Husk Power Systems,” says Pandey. Now HPS is developing a franchising and University offering–both of which will catapult the company that much more onto the global social enterprise stage. The University is meant to enlist partners from across India who want to open their own HPS franchise–the partners receive training, provide a portion of the necessary capital, and shoulder some of the risk involved, such as hiring and maintaining quality staff on the ground. So far HPS has engaged NGOs and small and medium enterprises (SMEs) and the goal will be to train partners to run the plants the way HPS would. Their model is “build, operate, maintain,” with an eye on community and social impact. The company also runs a number of initiatives helping rural women with jobs and training. HPS is also looking to expand to Nepal and Southeast Asia and eventually Kenya and Nigeria. Their success so far has surprised many of their social entrepreneur colleagues who at the outset thought they were too ambitious with their expansion targets. The company hopes to be in 10-15 countries in 10 years, serving 10-20 million people.